Boys need the time and space to explore. They need to get out in the world and climb trees, turn over rocks, and watch the clouds. They need to visit new places and seek out things of interest to them. They need to be trusted to go exploring! Take them places where they can look around and see new things or have new experiences while involved in things they already like. Give them time–don’t hurry them along, let them take as much time as they need to look and see, to touch and feel, to learn and discover. It is an easy thing to let children explore the world with our help. It can be a difficult thing to let them explore in the ways that work best for them. Believe that all of this exploring leads to a huge amount of learning even as they get older. It really does. Let the child touch and feel things they find interesting. Instead of “NO!” find a way to say “Yes, you can explore that this way.” Look for ways he can experience things in ways that makes sense. Give him plenty of opportunities to take his time so he can discover new things on his own. Encourage him by following his lead as he moves through the home or the world. Help if asked; respect the need for the child to do it himself. Let your boy explore with your help by taking him places he will find interesting and new. Take time to stop and let him really look at things. Don’t be in a rush. Let him observe and listen. Give him simple things to play with and let him explore and create. Boxes, sticks, cartons, tubes, a flashlight etc. Watch closely to see what he is enjoying at the moment and provide more, similar, materials for him to explore. Do a treasure hunt, a nature walk, a day-long exploration of an area. Find time for quiet observation. Allow the child to use his natural curiosity and see where it takes him. Let him lead. Help a tween explore his interests by giving him support when he asks for it and how he would like you to give it. Look for ways to provide materials he needs for exploring in the way that works best for him. Ask him what he needs. Expect a boy this age to want to explore on his own or with other kids, as well as with the family, and give him space to do so. Share related things that he might want to explore. Offer, but don’t insist that he try them. Support a teen’s need for independence with trust and understanding. Help him to explore even if his explorations make you uncomfortable (but are still safe.) Agree on guidelines for safety. Let him know you trust him and know that he is capable. Help him to develop his interests in a deeper way by connecting him with others who share those interests. 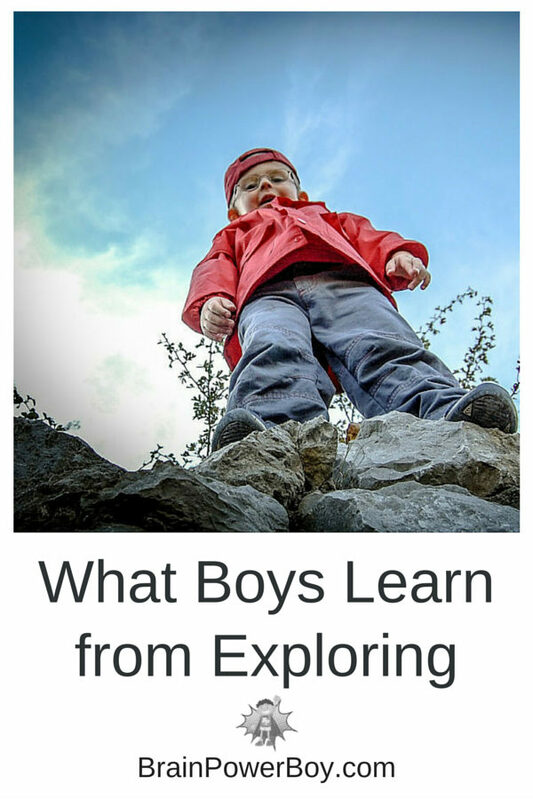 Boys who are allowed to freely explore are learning. They are learning about their world as well as their place in it. Exploring leads to learning. Encourage exploration in your boy and he will do the rest. For information on Boys’ Learning Styles and ways to help a boy explore in a way that best fits his learning style see each individual learning style. You might also like: Boys’ Learning, Top 10 Activities for Boys, and Sensory Bins for Boys. How do you help your boy explore? What benefits do you see to doing so? Sheila, thank you for great information here. 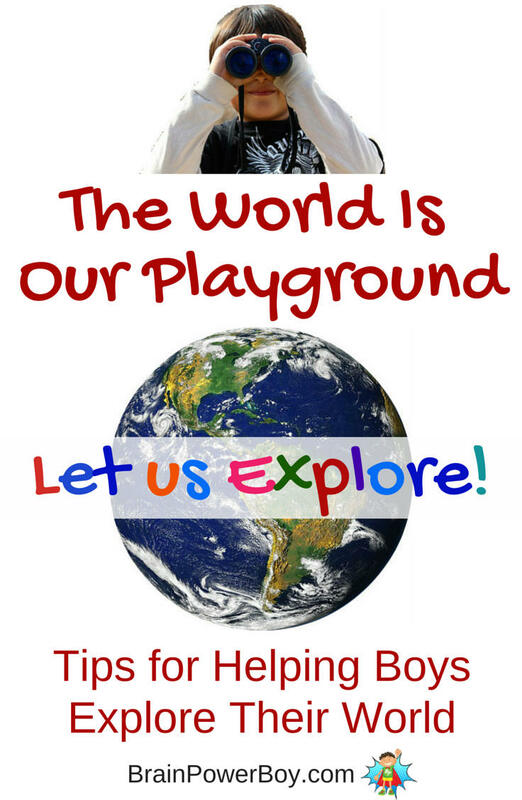 I have been working so hard to let my kids explore the world around them and boys are just different from girls! This gives me a lot of inspiration and encouragement. This post helps me because I tend to be a helicopter Mom when it comes to exploration especially with my son who tends to be more daring. I think too much ahead about uh-oh that could be dangerous even tho it’s probably just fine. Thankfully, my husband offers more freedoms for our kids and that balances us leaving them to be able to explore with caution and fun! Thanks for sharing this post at our FB Share Day. “Time to explore” – this is a critical component for all ages. We tend to think that our children will learn more from organized activities than from time on their own. Thank you for stopping by and for your comment. You are right that it is critical for all ages to have that time to explore. It seems that adult-led organized activities are replacing many hours of play and exploration. Something we need to be aware of so we can protect a child’s time. Such great advice! As a mum of a very active nine year old son, I can related to what you are saying about giving them plenty of time and not to rush them. Thanks for sharing on my facebook page. My boys definitely learn a lot from exploring, it’s great to let them do so at their own pace and they really enjoy it too, we love exploring old ruins and castles and that type of place. It really lets them connect with history in a more physical way and lets their imagination run wild! How wonderful that you have the opportunity to explore old ruins and castles. My son would Love doing that. Sheila, Exploring Leads to Learning for boys this is interesting especially for boys building self-esteem and fostering leadership skills all while learning at there own pace and all kids like fun. Thanks for sharing. Thank you Patrice. I totally agree with you that exploring can help children build self-esteem and foster leadership skills. Thank you for stopping by. Oh my gosh, this is awesome and totally well timed! My son is getting ready to turn 10 and I’ve definitely been feeling the need to push him off the electronics more and get out and experience life! Ah yes, electronics. I have the same issue here–especially when our weather has been way below zero with the wind chill–I don’t want to go out! But yes, we need to get these boys out and, like you said, have them experience life. Yes!! Exploring the world is truly being a part of it. I travel through Nicaragua frequently and love seeing families who bring their children with them to travel throughout Central America, teaching them to chat with the locals, negotiate at the market and in general just explore a world outside of their own. Exploration is where all the learning happens. Wow, that is quite the experience you have had with exploring! How wonderful. Thanks for sharing. Hi! I found your blog through the FB group and love it. This post really speaks to me, because even though I do not have children of my own, I do have nephews. I totally agree that boys need plenty of time for play, and, well, just to be boys. The chart of activities by age is also quite helpful. Great post! Thank you so much for your kind comments. I appreciate you taking the time to stop by and leave a comment. This is a great breakdown of ages and stages, Sheila! I have two grandsons, and want to create fun activities to do together, that take advantage of their optimal ways of learning, too. This will be a great tool to help with that. Thanks for putting this together! Kristin, I appreciate your comment very much. Thank you for stopping by. Have fun with those grandkids! Brilliant article, really well presented and clearly explained for each age group – I am dreading the independence in the teens for my boy – I know I will have to let them explore, and make their own mistakes, but it really isn’t easy sometimes! Thanks so much for linking up to the parenting pin it party. Thank you so much for your nice comment. I agree with you that it sure isn’t easy. I have a hard time myself. There have been things that my son wanted to do that made me take a deep breath and relax before responding 🙂 if I didn’t do that my answer would have jumped to No right away. It is hard sometimes, isn’t it? Glad you enjoyed the article.